VSU's Mass Choir poses together after winning the Warren Jemarcus Williams Scholarship Fundraiser. The group won $1,000, beating out Georgia State's Mass Choir. 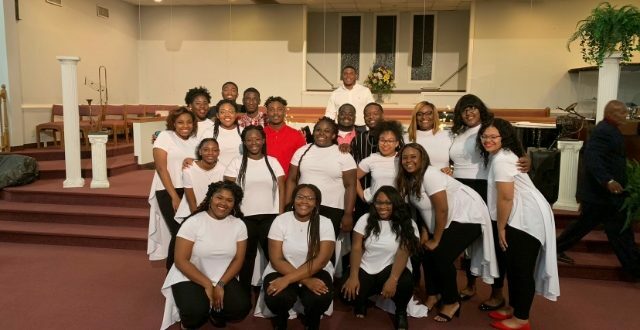 VSU’s Mass Choir is singing all the way to the bank as it earned a $1000 prize in the Warren Jemarcus Williams Scholarship Fundraiser in Lilburn, GA. Performing “Hope” by Dexter Walker and Zion Movement, Mass Choir managed to beat out Georgia State University’s own team for the prize. According to Aria Dinkens, junior alto, it was the group’s positive spirits that really won the competition. The choir was entered in the competition this past August by its Director, Carlton Freeman. According to the members, Freeman entered them to show off their skills, but he found the bonding experience and the cause to be the most important part of the fundraiser. The son in question is Warren Jemarcus Williams, Gainesville College basketball player and member of the Salem Missionary Baptist Church’s youth outreach choir. He was just starting his freshman year at Gainesville College in Athens, Georgia when he suffered heart failure during a basketball game on March 31, 2006. Williams turned out to have an undetected heart disease called hypertrophic cardiomyopathy. It caused his death later that night. In his honor, his parents started the scholarship foundation, making way for VSU’s Mass Choir to reach out and compete. Dinkens said she and Mass Choir were excited all throughout the competition. They weren’t the only ones either. Hope’s original Songwriter, Dexter Walker, took to Facebook to praise their performance. Dinkens said Mass Choir’s future is looking bright from here. This story was updated by Bryce Ethridge on Nov. 28 at 6:16 p.m. Written by Malia Thomas, Staff Writer. Photo Courtesy of Aria Dinkens.